Man. German was not a friend of mine last week. I felt like everyone I talked to was the teacher from Charlie Brown and spoke in “wah-wah’s”. I even had issues in class when our teacher asked me a very simple question, a question that normal functioning Holly would have understood just fine, but for some reason psycho non-functioning Holly was the one who showed up to class that day. Not only did she repeat her question to me, she explained it, and explained it further, and even my husband jumped in on it and tried to explain the question to me in ENGLISH, and I just…existed. They could’ve been speaking Chinese to me for all I knew and I doubt I would’ve realized it. It almost felt like a weird out-of-body experience, which yes, I stand firmly by my belief that I have had one of those before. I think it’s safe to say that last week was a result of language-learning-overload. I didn’t feel overwhelmed, or feel like my brain couldn’t hold anymore new vocabulary words or one more reflexive verb (they are mind-boggling though), but I guess my mind had had it and put itself on cruise control. In my mind’s defense, we’ve been through a lot together lately. In September, I attended an annual retreat called Frauenfreizeit in Filzmoos, Austria. This retreat is for women in German-speaking Europe to come together for 6 days in the beautiful, quiet, mountainous countryside of Filzmoos in order to learn from one other, have some free time to themselves, and spend time in devotion with the Lord. While I did learn from the other women, have a ton of free time to myself (I got sick halfway through and was in bed for 2 days), and spend time in devotion with the Lord, these 6 days were an unreal, near unimaginable workout for my German. The sad part is I totally thought I could handle it. I’ve been here for 4 months… Go to church with Austrians… Go to the store all the time without wanting to hide… So not a big deal. Weeeell, nope – It was so a big deal. I sat in class wide-eyed, anxiety-ridden, and clueless. Hochdeutsch (High German) was nonexistent and in its place were dialects from Switzerland, Germany, and Austria. Occasionally I would grab a “leben” or a “lieben” or “Gottes”, but other than that, nothing was getting through. At one point in the week, two of the women, one in her 60s and the other in her 70s, started arguing in front of the rest of us as class began. Their voices got higher and higher, and they started yelling at each other and pointing this way and that until they both were on their feet, yelling in each other’s faces until one of them stormed out of the room. I don’t have to tell you that I was freaking. out. during this intense time of sweet grandma vs. sweet grandma. They were so angry and it all happened so fast and I couldn’t figure out why no one else seemed to be concerned. Within seconds, the lady who stormed out came right back in, smiling enormously while the other women burst into laughter and applause. Turned out the two ladies were putting on a play as a way of leading into the “Vielen Dank für Schwierige Leute” (“Thank You for Difficult People”) lesson. Everyone knew it was a skit and I’m here thinking these two older women really need to get some issues sorted out. A similar instance happened during another lesson when one of the women started to cry while she told a story. All the other ladies were dabbing their eyes and blowing their nose, and there I am, No Feelings Holly, dry eyed and frantically thinking “What’s wrong?! Why is everyone so sad?? What’s going on?” Thankfully she was just telling a story which happened to be especially touching. Hopefully this week will bring about more understanding and better speaking. Auto cruise control has always made me nervous, and being in mental cruise control is even worse. In other news, my purse was stolen about an hour and half ago, so there’s that. While I am extremely miffed, I survived the whole ordeal without being aware it was even taking place!… which I guess isn’t necessarily a good thing. My purse was around me, then it was not around me. Will and I have taken all of the necessary “my stuff was stolen” steps and will spend the morning getting all of my Vienna cards back. Hooraaaay. So I’m going to eat a couple of grilled cheese sandwiches, and you can enjoy this drawing I did while Will was on the phone with the credit card company. 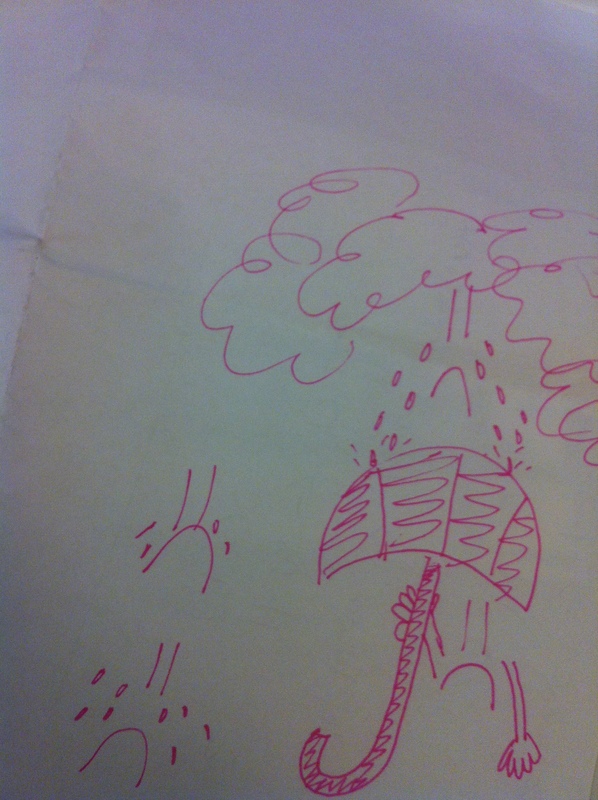 It’s a sad face holding a sad umbrella shielding him from the tears of the sad face surrounded by sad clouds, accompanied by two other crying sad faces. I haven’t actually cried during this ordeal – just my pen. Oh that’s a good idea! We’ve started with language partners to improve ours. Helpful stuff.